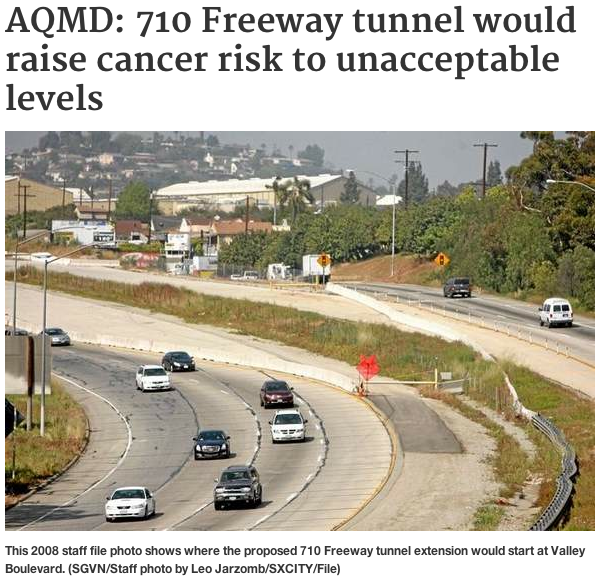 SCAQMD: 710 Freeway Tunnel would raise cancer risk to unacceptable levels - Many comment letters from municipalities, organizations and public agencies have also been coming in to the No 710 Action Committee. One in particular has received much attention, and it's from the South Coast Air Quality Management District (SCAQMD). The SCAQMD letter was the subject of an article by Steve Scauzillo in The Pasadena Star News and San Gabriel Valley Tribune. The issues raised by SCAQMD are critical to all of us. The cancer risk is actually greater than presented in Scauzillo’s article. The DEIR/EIS used outdated methodology to calculate cancer risk. The South Coast Air Quality Management District's research found that the cancer risk, especially to children, was being UNDERESTIMATED by 200% - 300%, and recommended changes in the methodology for determining risk. The Office of Environmental Health Hazard Assessment (OEHHA) adopted the recommendations. The new methods take into account the physiological differences between children and adults. Overall, the cancer risk is 2.5 times higher than reported in the DEIR/EIS. 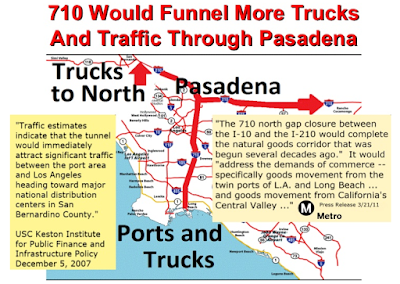 Particularly disturbing is that Metro, Caltrans and their consultant, CH2MHill, were notified at a public meeting by a member of the SCAQMD Board of Directors of the new findings and change in methodology a year before the study was released. He emphasized the need for them to use the new methods. In their infinite wisdom, they chose to ignore him. There was also a discussion of the SCAGMD findings on KPCC's AirTalk with Larry Mantle recently. "Another bump in the road: Report say 710 EIR does not account for Cancer risk." La Canada former Council Member and former Mayor, Donald Voss, South Pasadena Vice Mayor and Council Member Marina Khubesrian, and Alhambra City Council Member Barbara Messina -- took part in a discussion of the SCAQMD findings. You can listen to the 25 minute broadcast by clicking here. 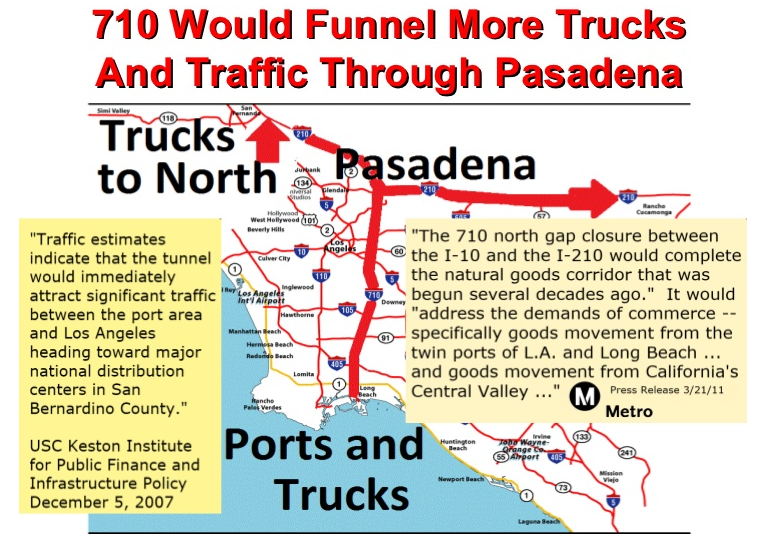 Also covered on NBC News: 710 Freeway Tunnel Health Concerns - "A new study shows building a tunnel along the 710 Freeway could be hazardous to your health. 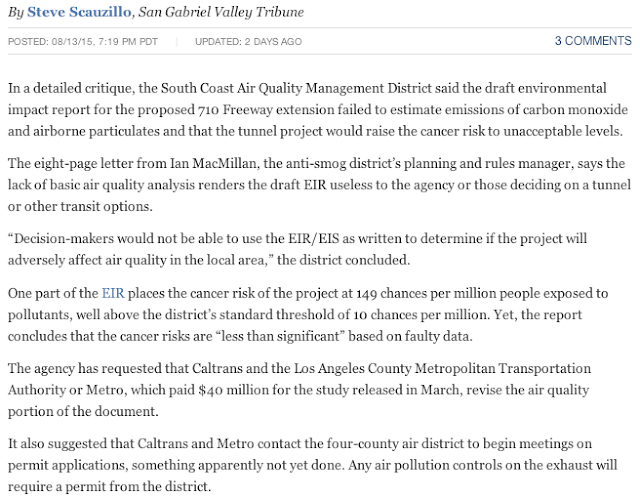 The report from the South Coast Air Quality Management District shows a negative environmental impact for the proposed project." Link to NBC News coverage here.